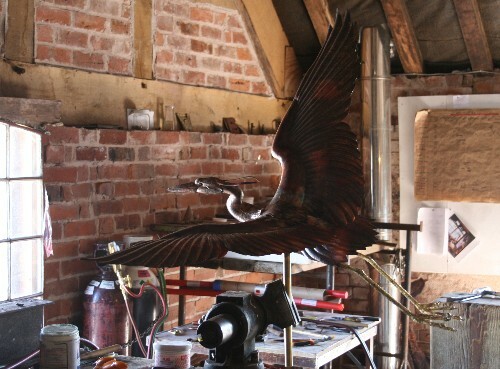 We put the finishing touches to the heron today. Bronzing the legs is always a bit treacherous, as the molten metal moves in it's own contentious way (almost like lava, it seems to shift, collapse & slump along under the thinnest of "skins"). Fixed the long wispy feathers behind the heron's head (what are these called? ), and closed the tummy to the shaft. "She" goes into the bath now, to soak off all the sediment and flux. The brass gets cleaned with acid, and then the whole piece gets waxed with bowling alley wax to make it shine. I think I have a wasps nests at the door of the studio. Not the best place considering the flag stone steps. It will challenge our "no spray" policy. It's amazing how many types of bees hover & disappear into the old "Tyberton" brick. Finished reading The House at Pooh Corner to my youngest tonight. It's always quite strange to re-read something from your childhood...although I was admittedly more of a Pippi Longstocking fan. Can anyone else recite Good Night Moon (Good night Moon, good night room, good night light and the red balloon). Amazing what you find has been lodged in your brain. For some strange reason I can also recite Patrick Henry's speech (It is in vain, sir, to extenuate the matter. Gentlemen may call Peace Peace, but there is not peace. The war has actually begun...). Browsing through our first The World of Interiors. Such a relief to be looking at interior spaces like the Calder Foundation's galleries in New York. Wouldn't you rather live there! With the Miro paintings on the wall and all that lovely white space. Watch the movie "Once". Lovely Irish film.